How hard we work to control how others perceive us! At a minimum, we do not want to be embarrassed, so we bathe, dress acceptably, and style our hair, if we have any. For many, that is just the start. We add beauty products and treatments, lessons in poise and elocution, voice modulation and plastic surgery. Soon there will be a Photoshop app that will make us sparkle. Just carry it in your pocket! Even then, those who love us will see us as we are and will keep on loving us anyway, some even when they are not loved back. Photo looking south on N. 10th Street in Philadelphia, Pennsylvania. 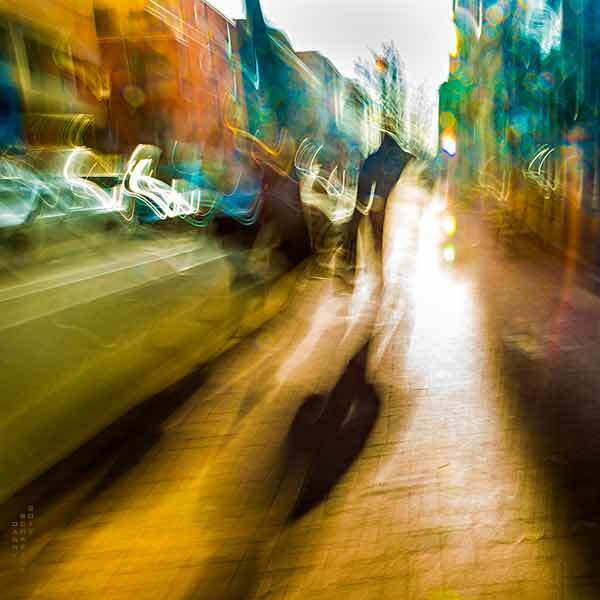 With a shutter speed of 1/3 second, people, limousines, and buildings get blurred. These comments come from three professional photographers, a graphic designer, a theatre manager, a nursing instructor, and a non-profit CEO who keeps bees. Another great one Danny! So insightful, and dead-on, and paired with the perfect artfully composed image as always. So thought provoking. I will enjoy reading this one again and again. Been thinking about this very topic – how we teach our young professionals-to-be – in their manners, dress, overall demeanor – how to be more “professional” with their patients (I teach student nurses). Your last line is the bottom line – it’s in how we relate to those entrusted in our service, to treat them as human beings worthy of love, respect, our time, our professional best, no matter what state they present themselves to us. Danny: an outstanding photo: thank you for posting it! Danny, that is a powerful image! On many levels. Well done.